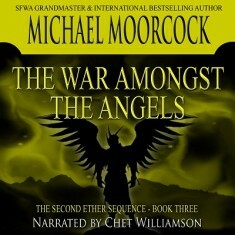 My audiobook narration of War Amongst the Angels, the final volume in Michael Moorcock’s epic Second Ether Trilogy, has been released. The novel, like the entire trilogy, was a challenge to narrate, with its massive, international cast of characters, its varying prose styles, and the fact that the last volume is narrated throughout by Rose Von Bek, an Englishwoman. Moorcock is one of the most erudite of writers, and his constant use of foreign words, place names, and phrases had me running to the Internet for the proper pronunciations. It was well worth it, though. The saga’s ending is a remarkable one, and I only hope I did it justice. The unabridged audiobook is available at Crossroad Press for $12.99, at Amazon, and at Audible.com.